Over three parts, she takes traditional storytelling and gives it a unique, contemporary twist. In ‘Heat’, we meet several generations of the Kresinger family and the legacy left by the mysterious Pearl. In ‘Water’, van Neerven offers a futuristic imagining of a people whose existence is under threat. While in ‘Light’, familial ties are challenged and characters are caught between a desire for freedom and a sense of belonging. 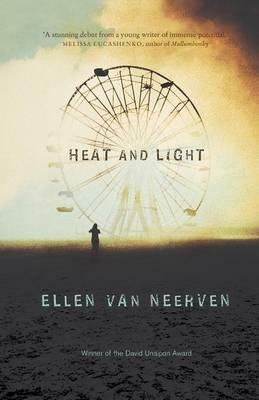 Heat and Light presents a surprising and unexpected narrative journey while heralding the arrival of an exciting new talent in Australian writing. In 2013, a young Queensland writer, Ellen van Neerven, was awarded the prestigious David Unaipon Award. Among short-fiction writers in Australia, news travels fast when a new kid appears on the block. Along with many writers, I eagerly anticipated the release of van Neerven’s first book. She had earlier tantalised readers when one of her stories, ‘S & J’, was published in Issue 41 of McSweeney’s in 2012, and the story is now included in the superb Heat and Light. The collection is thematically presented under the motifs of ‘Heat’, ‘Water’ and ‘Light’. While together the stories represent a tender slice of a greater whole, each section is crafted with individual care. Many writers attempt to convey the sense of foreboding that exists ‘out there’, beyond the big cities and seaboards of the country. Some fail. Few succeed to the extent that exists between the pages of Heat and Light. The maturity displayed by van Neerven is evident immediately in the book’s first story, ‘Pearl’, set in the terrain of marginal Australia, both geographically and socially. The young narrator is an observer to the fragmented lives of the town and the resulting experiences of prejudice. She is also, somewhat mysteriously, sensually immersed in it. Van Neerven’s characters both love the country and are acutely aware of its potential for violence – although much of this is wrought by those with little respect for the land or those who live on it. This is no more evident than in the final section of the book, ‘Light’, an ensemble of 10 stories providing a remarkable insight, for better and worse, into family and social dynamics in a landscape that is both nurturing and unforgiving. I am certain this is just the first of many books from this remarkable young talent. Tony Birch is the author of Blood, shortlisted for this year’s Miles Franklin Award. He has also published widely as a short-fiction writer.